Family Blogging Month was a terrific success! The top three students won a free meal at the Marmalade Cafe and an opportunity to publish a free-choice post on our classroom blog! Watch for their posts coming soon! Thank you to all the parents, grandparents, aunts, uncles, cousins and friends for your participation! We hope everyone will continue to participate in our learning community! What do you like about Family Blogging Month? Which family members left comments and where do they live? Congratulations to the top three winners. I will be looking forward to reading your posts. I love blogging family month as it is a wonderful way to involve as many family members to learn about blogging. 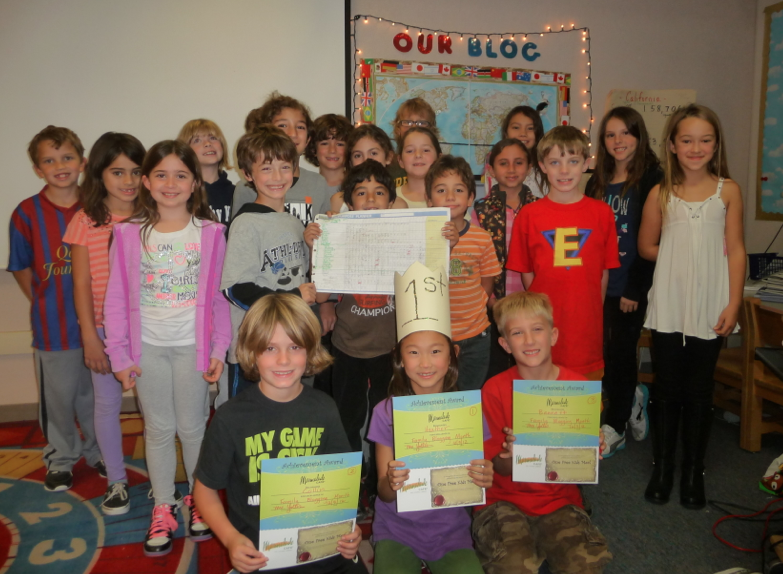 Congratulations to the top three winners and to the rest of the class for an amazing family blogging month! There was so much participation! It sure was fun to read all the posts from the families and friends of all the students. In our family, we had uncles, aunts, cousins, grandma, grandpa and dear family friends post. They wrote about everything from their travels, to growing up in China, growing up in the depression, being a policeman, traditions and a little about experiences with Jenna as a baby. What great fun! involve family and friends in Jenna's educational life and to learn a little about her fellow student's family and friends. Meanwhile, the students continued to learn to read and write and learn a bit about social science issues as well! It was an all around wonderful experience. Our family (and friends too) really enjoyed it! Congratulations family blogging month winners! I enjoy the month and came close to winning. Maybe I'll win in April when Mrs. Yollis runs the second Family Blogging Month. Why did you like family blogging month? Congratulations Heather, Bennett, and Collin! I am so amazed about how many comments have been published. 144 comments were published. But my favorite part was typing and learning with and about families. Family Blogging Month is my favorite post on the classroom blog. Hope all the families are happy! I liked everything about Family Blogging Month.Bennett's enthusiasm and dedication to the experience was contagious. Great effort Bennett.I learned from all of you and learning something new everyday is exciting. Family Blogging Month was awfully exciting! I was one of the winners and I got first place. I posted forty-nine comments. Collin got second place. He posted forty-seven comments. Bennett got third place. He posted forty-five. Can you notice something about these numbers? My favorite post was Family Blogging Month from 2010. I like it because there were a lot of conversations and my brother was in that class. What was your favorite post and why? Some of my family participated in Family Blogging Month. They were: my mom, Echo, my brother, Aaron, and me, Heather. Hope you win next time! Congratulation! Good job, you guys did great. Our class blog got over 100 comments on the blog! Wow I think that is a lot of comments and we got that many comments less than a month! I had a lot of fun at family blogging month. Did you enjoy family blogging month? It was awesome to participate in Family Blogging Month! Congratulations to Heather, Colin and Bennett! Enjoy your meal at Marmalade Cafe. Here are some family members that commented: Mom, Dad, Wyatt and Miles. We are glad that you are watching out for posters. Heather, Collin, and Bennett, are the three winners of Family Blogging Month. Clearly, Heather wants to win again. The Family Blogging Month winners all get a chance to make their own post. Collin is starting his post. Do you have any family who can do Family Blogging Month in April? Family Blogging Month was wonderful! My mom, Echo, brother, Aaron, and I all participated. Sadly, my dad did not have time to participate. The people in my family all were from China, except my brother and me. How many people did your family participate in Family Blogging Month? Since there is another Family Blogging Month in April, I might win again. (Did you notice my dependent clause?) Prepare for the next Family Blogging month in April! I l♥ved Family Blogging Month. I thought it was a great opportunity for families from different states and even continents to learn about what it is like there. Since I won Family Blogging Month I will go to Marmalade Cafe with my award. Well... Family Blogging Month has started up again! As you can see, I won last year. Everybody wants to win, so it will be a challenge for me! It is definitely possible that someone else could win, and I could lose. I am crossing my fingers that I am going to win! In second grade, we skipped the Family Blogging Month in April. I was hoping that there would be a Family Blogging Month in April, but sometimes things don't go the way you want them to go. The reward for the top three winners are one free-choice post and a free dinner (lunch and breakfast too) at Marmalade Cafe.